Old, non-functioning computers are found in bulk in business closings, school auctions, and even on Craigslist for free. 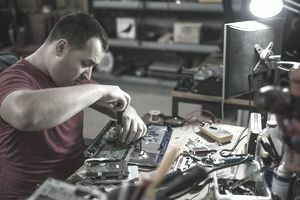 In previous articles, I described how to scrap an old television, as well as how to scrap a CRT monitor. This article describes how you can take out valuable metals such as gold, copper, and aluminum from a desktop computer (not including the monitor). And while sleek modern laptops do not provide the bounty of precious metals found in heavier, older units, they can remain profitable, just the same. One report suggests that an older laptop may contain $30 worth of gold, while newer units would include gold worth $15 to $25. Besides, it notes, there are still a lot of old laptops in storage that will eventually have to be recycled. Find the screws fastening the case with the computer normally on the back side of the computer and unscrew them with a screwdriver or a power drill. After that, you should be able to easily open one side of the case. Normally, newer model computers are easier to open. To make the process easier, cut the wires you find just after opening the case. You can use a bolt cutter to do that. Some of the wires may have gold plating ends, so make sure you cut and keep the gold plating ends. The RAM is normally secured with small plastic tabs on the ends. Gently push the plastic tubs on each end and easily pull out the RAMs. The CPU is nearly always covered with a heat sink. The CPU has a small throw switch which needs to be UP to open that up. There is a strap as well that holds the CPU to the heat sink. To take the PCIs off the motherboard, simply give it a strong nice pull and the whole thing will easily get ripped out in one go. If that doesn’t help, find one or more screws fastening the PCIs with the motherboard and unscrew them. PCI boards have gold plating fingers and you can cut them off and sell separately for good cash. Pulling out all these components should be easy now. Use a power drill or screwdriver to unscrew the screws fastening the motherboard with the case. Unscrew all the screws to pull out the hard drive, hard disks, and power supply as well. Now, make separate piles each metal component. The big chunk of aluminum just below the cooling fan and the cooling fan contains copper bearing motors. You can find another copper bearing motor within the power supply. Just below where the CPU location, you can find gold plated pins. Whatever golden things you find, simply cut and take them. You can make the process simpler by looking for gold, aluminum, and copper and make a separate pile for each. Once you are done accumulating all the metals, it is time to cash out. Look for a scrap yard near you. You can also sell the Motherboards, RAMs, CPUs, PCIs, Gold fingers and other gold plating parts online. Be careful dealing with online vendors. Selling these items on eBay is a good idea as it normally pays more than what you can get from a scrap yard.